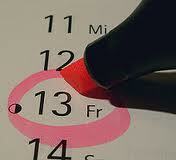 Do you worry on Friday the 13th, or do you think the whole superstition is a joke? I don't worry about Friday the 13th. I don't even know how that superstition even got started. (Note - must Wikipedia this later!) I guess I would be considered superstitious. Either that or OCD. I'm not scared of black cats (being the owner of one and all) and I don't care if I walk under a ladder....but I sometimes catch myself hesitating if I ever have to open an umbrella indoors. I wonder why my brain says 'oh this one is okay' but freaks out over another one. I don't even know what the alleged retribution for such an 'offense' is supposed to be. I remember sleepovers where the girls wanted to play Bloody Mary, Light As A Feather Stiff As A Board, Ouiji Boards & the like. That used to terrify me! As an adult, I'm not so scared. When you realize that Ouiji Boards are made by Hasbro, the 'scare factor' goes down considerably.